Waverly Hills Sanitarium is a huge building that's construction began in 1908 to treat those infected with Tuberculosis. 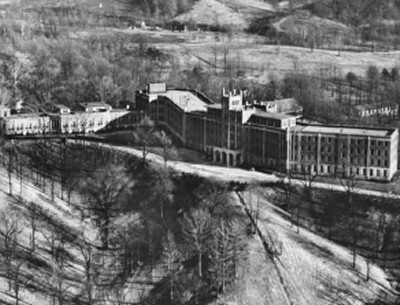 The original building was designed to house some 20 patients and was filled within a couple weeks, so construction to build a 5 story-400 room sanitarium was in the works located on the south-western end of Louisville, Kentucky on one of the highest hill points in the city so patients could be both secluded and get the freshest air possible. The Tuberculosis epidemic blasted out of control and the facility was packed beyond control. Patients in the 1920's died at a rate of 1 person every 30 minutes, so to keep the moral of the other patients up the doctors designed a passage way through the hospital to an outside tunnel that ran down the side of the hill to the bottom where train tracks passed through. They sometimes burned the bodies on the grounds if bodies began to stack up in large numbers, most were taken through the tunnel, known as the "body chute" to an awaiting train the carted the bodies off to be cremated. The building was closed as a Tuberculosis Sanitarium in 1962 due to the eradication of the disease. The building was reopened in 1963 as a retirement home for the most down trodden. The facility was closed due to patient abuse and neglect in 1988. In all over 6,000 people died in the 5 story building known to all as Waverly Hills. As a kid I heard of some of the ghost stories but took them as only stories but very interested in getting a closer look of the place. This was in 1990. Just prior to this a homeless man and his dog were sleeping in the building, 2 teenage boys whom mingled in devil worship entered the building, attacked the man and murdered him in the name of Satan and threw his body down the empty elevator chute. At this time there wasn't any security in sight. My sisters boy friend led myself and 2 friends to the area at the bottom of the hill, it was about 11:00 at night so being dark we stumbled upon a hole in the ground which served as a ventilation hole for the "body chute". My 2 friends and I climbed down into the tunnel which was pitch black, we had no flashlights so we felt along the wall and headed up-hill, besides bumping into several hospital beds or transport items it was pretty eerie. As we exited the tunnel there it was, the five story monstrosity, Waverly Hills. We found an entrance into the buildings ground floor, eyes adjusting to the darkness we saw that the place had been totally trashed over the past 2 years by trespassers. Spray paint all over the walls and down the halls. Equipment still intact in many of the rooms, the doors to the patients rooms were still there, they are removed now. On our journey to the top floor which led out to the roof area we came upon the elevator shaft, the doors open with no elevator, and stared down at the spot where the homeless man was found murdered. Other than several creepy noises everything seemed fine. We found the 5th floor which contained only 4 small rooms, used as a nurses H.Q. and the infamous room 502 where 2 nurses lives ended. Both believed by suicide, one a pregnant nurse hung herself from a pipe that ran across the ceiling just outside room 502 just several feet from the elevator. The other nurse plunged to her death out the window of room 502. My friends and I went out on the roof and just hung out thinking about the stories we heard about the place when we began to see figures moving around in the dark inside the area of the 5th floor where the patients were bedded outside for air. Shadows everywhere, we began to see perfect formations of shadows of people that were not there. My friend Chris lost his cool and wanted to bolt out of the place by jumping from the 5th floor roof. I said, "Are you nuts? We gotta go back out the way we came!" So after building up the courage to face whatever it was in the halls and rooms on the 5th floor and exit we had to enter it. We couldn't run due to the darkness and the mess the place was in so we held tight on our arms and entered the hall area. I wanted to shut my eyes but I had too see where I was going. Mostly I saw the shadows surrounding us, banging that seemed to come from everywhere, the ceiling, floor, and walls. As we entered the stairwell we somehow ended up on the floor below us and not the ground floor. As we entered the 4th floor our eyes were more adjusted. The moon light reflected through the building and we had a pretty good sight of the hall up to the point where the hall bent in a slight angle. It had rained the night before and due to the shape of the building and no windows left to block it out the rain entered the building at will. On the floor were puddles of water and we began to see bare foot prints appearing out of the puddles as if someone had just walked through the puddle bare footed and left tracks. The shadows were still surrounding us in the halls. The doors to the patients rooms began to slam shut. Chris, who acted as the toughest guy in the group, began to cry. As I tried to calm him down something crashed against the wall near where we stood. When I looked to the floor it was a brick. Something had just hurled a brick at us hitting the wall. Chris then began to run down the hall and we gave chase. At some point between Chris and us, behind Chris and in front of us, 2 bright balls of light shot from one room across the hall and into the adjacent room. We ran past the area where the light traveled to get to Chris who stopped at the end of the hall not knowing where to go. We calmed him a little and it was as if someone just shut it all off like a light switch. There were no more shadows, no banging, no flashing light. We made our way out of the building and down the hill to the nearby apartment complex where my sister and her boy friend were waiting inside their car. They laughed at our stories. We talked about it for several days and began to forget, I never forgot. Years later I joined a local paranormal research group whom had major interests in investigating Waverly Hills. After hearing all the stories things began to fall in place and I found it within myself to return to Waverly Hills after 10 years. It is now being restored, slowly but surely, possibly into a bed and breakfast. Tours are given there now and have been for the last 5-6 years. They have a yearly haunted house on Halloween and half night and all night stays, for a fee of course. Aall proceeds have gone to fixing the place up. That is my story of Waverly Hills and it is just one of very many. Contributed by Joey and Copyright © 2007 True Ghost Tales all rights reserved. No part of this story may be used without permission. Many of the details that you have posted about Waverly Hills have been proven false. It was no where near 63,000 deaths, more like 6,000 (I can prove this). The rate was around 1 death every 3 days not every 30 minutes. Also, the pipe above 502 is part of the sprinkler system installed in around 1973 so there is no way a nurse was hung there in the 1920s. The lie goes on and on.